If your cat is your best friend, then treat him to the flavor choices of the BFF Variety Pack Grain-Free Cat Food Pouches. Coming with two pouches each of six delicious flavors, every recipe is full of healthy goodness that uses real meat as the star ingredient. The easy-to-serve pouches come packed in gravy, which is cat-tastic for the kitties who love to lick. 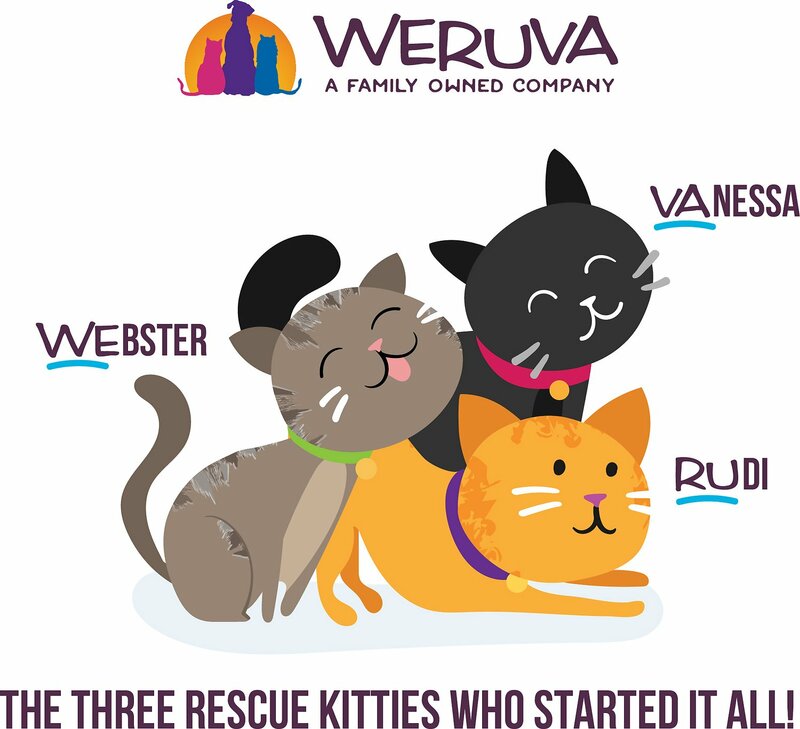 They’re also rich in protein and fatty acids, so that your cat has all the nutrients he needs for a healthy, happy life. And to make matters even better, it’s all free from grain with limited carbs—just how your cat likes it! High-protein and low-carbohydrate diet delivers the high moisture and nutrition that your cat needs. Added vitamins, minerals and antioxidants offer a complete and balanced meal for adult cats. Completely free of grains, which is a common allergy trigger for cats. Natural recipes are made in a human food facility to ensure the best quality. Comes with two pouches each of six delicious flavors. Great alone or as a kibble topper to add variety. Tuna & Chicken – Charm Me: Tuna Broth, Tuna, Chicken, Tapioca Starch, Sunflower Oil, Guar Gum, Calci um Sulfate, Tricalcium Phosphate, Potassium Chloride, Celery Powder, Salt, Vitamin E Supplement, Ferrous Sulfate, Niacin Supplement, Zinc Oxide, Thiamine Mononitrate (Vitamin B1), Taurine, Vitamin A Supplement, Vitamin B12 Supplement, Vitamin D3 Supplement, Manganese Sulfate, Calcium Pantothenate, Riboflavin Supplement (Vitamin B2), Pyridoxine Hydrochloride (Vitamin B6), Biotin, Copper Amino Acid Complex, Sodium Selenite, Folic Acid, Menadione Sodium Bisulfite Complex (Source of Vitamin K3), Potassium Iodide. Tuna & Beef – Baby Cakes: Tuna Broth, Tuna, Beef, Tapioca Starch, Sunflower Oil, Guar Gum, Calcium Sulfate, Tricalcium Phosphate, Potassium Chloride, Celery Powder, Salt, Vitamin E Supplement, Ferrous Sulfate, Niacin Supplement, Zinc Oxide, Thiamine Mononitrate (Vitamin B1), Taurine, Vitamin A Supplement, Vitamin B12 Supplement, Vitamin D3 Supplement, Manganese Sulfate, Calcium Pantothenate, Riboflavin Supplement (Vitamin B2), Pyridoxine Hydrochloride (Vitamin B6), Biotin, Copper Amino Acid Complex, Sodium Selenite, Folic Acid, Menadione Sodium Bisulfite Complex (Source of Vitamin K3), Potassium Iodide. 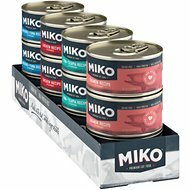 Tuna & Salmon – Sweet Cheeks: Tuna Broth, Tuna, Salmon, Tapioca Starch, Sunflower Oil, Guar Gum, Calcium Sulfate, Tricalcium Phosphate, Potassium Chloride, Celery Powder, Salt, Vitamin E Supplement, Ferrous Sulfate, Niacin Supplement, Zinc Oxide, Thiamine Mononitrate (Vitamin B1), Taurine, Vitamin A Supplement, Vitamin B12 Supplement, Vitamin D3 Supplement, Manganese Sulfate, Calcium Pantothenate, Riboflavin Supplement (Vitamin B2), Pyridoxine Hydrochloride (Vitamin B6), Biotin, Copper Amino Acid Complex, Sodium Selenite, Folic Acid, Menadione Sodium Bisulfite Complex (Source of Vitamin K3), Potassium Iodide. 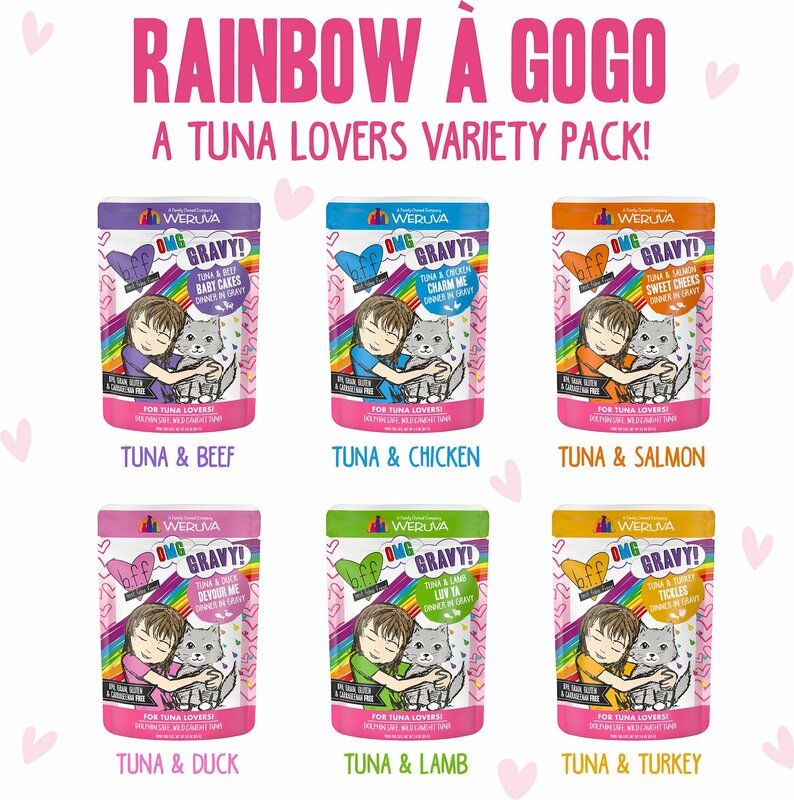 Tuna & Lamb – Luv Yas: Tuna Broth, Tuna, Lamb, Tapioca Starch, Guar Gum, Calcium Sulfate, Tricalcium Phosphate, Sunflower Oil, Potassium Chloride, Celery Powder, Salt, Vitamin E Supplement, Ferrous Sulfate, Niacin Supplement, Zinc Oxide, Thiamine Mononitrate (Vitamin B1), Taurine, Vitamin A Supplement, Vitamin B12 Supplement, Vitamin D3 Supplement, Manganese Sulfate, Calcium Pantothenate, Riboflavin Supplement (Vitamin B2), Pyridoxine Hydrochloride (Vitamin B6), Biotin, Copper Amino Acid Complex, Sodium Selenite, Folic Acid, Menadione Sodium Bisulfite Complex (Source of Vitamin K3), Potassium Iodide. 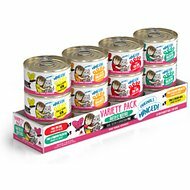 Tuna & Turkey – Tickles: Tuna Broth, Tuna, Turkey, Sunflower Oil, Tapioca Starch, Guar Gum, Calcium Sulfate, Tricalcium Phosphate, Potassium Chloride, Celery Powder, Salt, Vitamin E Supplement, Ferrous Sulfate, Niacin Supplement, Zinc Oxide, Thiamine Mononitrate (Vitamin B1), Taurine, Vitamin A Supplement, Vitamin B12 Supplement, Vitamin D3 Supplement, Manganese Sulfate, Calcium Pantothenate, Riboflavin Supplement (Vitamin B2), Pyridoxine Hydrochloride (Vitamin B6), Biotin, Copper Amino Acid Complex, Sodium Selenite, Folic Acid, Menadione Sodium Bisulfite Complex (Source of Vitamin K3), Potassium Iodide. Tuna & Duck – Devour Me: Tuna Broth, Tuna, Duck, Tapioca Starch, Sunflower Oil, Guar Gum, Calcium Sulfate, Tricalcium Phosphate, Potassium Chloride, Celery Powder, Salt, Vitamin E Supplement, Ferrous Sulfate, Niacin Supplement, Zinc Oxide, Thiamine Mononitrate (Vitamin B1), Taurine, Vitamin A Supplement, Vitamin B12 Supplement, Vitamin D3 Supplement, Manganese Sulfate, Calcium Pantothenate, Riboflavin Supplement (Vitamin B2), Pyridoxine Hydrochloride (Vitamin B6), Biotin, Copper Amino Acid Complex, Sodium Selenite, Folic Acid, Menadione Sodium Bisulfite Complex (Source of Vitamin K3), Potassium Iodide. Feed according to the age, size and activity of your cat. If fed alone, feed 1.0 oz for each lb of bodyweight daily, best fed twice a day. Your cat should have access to clean, fresh water. Refrigerate after opening. This food is my cat’s favorite. I don’t give it to him every day but a few times a week. He doesn’t pick the chunks out of the gravy and eats it like it’s his last meal. I have no problem with him eating it all. I don’t think it fills him up which is why I don’t give it to him every day and is my only issue. He always digs into his dry food after he finishes this. Happy my kitty loves it! Meh could be better; could be worse. I have mix feelings on this brand of food pouches. For starter when we received the box one of the pouches was busted open which cause all the bags inside it to be smelly and gross feeling. Aside from that the food itself has a weird texture. I was hoping for shreds of meat instead we got a blended pouches that look like it was left in a blender for too long. While my cat does eat it; I was hoping for more. I have a 1 male and 1 female cat. My female is a healthy eater and zooms around the house 24/7. My male cat is big boned and never has been a big eater. They became addicted to Temptations treats and wouldn't eat anything else when they were about a year old. He has urinary issues and is on dry Science Diet S/D he hates the wet and so does the female cat. We give them 1 to 2 packs of OMG BFF between the two of them. This is the balance we have found for our male cat to stay satisfied and and not left out when the other cat gets a treat. We don't feed them temptations anymore this is there daily treat. I recently decided to get my cat off of canned food and switch her to pouches due to her love of gravy, and my hopes of finding something less processed. I ordered four different brands of pouches, kitty likes these a lot. This pack is great because it really offers a variety of flavor fusions. My cat will only typically eat dry food. I can get her to have some tuna and once in a while find a wet food that she'll try. She's older, losing teeth and really needs to have more soft food in her diet. I tried this and she loves all of the flavors in this box. Not much Solidat All! No go! Finally, a wet food the cats agree on! I have a cat who adores wet food, and another that is quite blasé about it. B.F.F. variety gave us the opportunity to sample a large selection. We have found what Charlie Parker will (and won’t) eat. It goes without saying that Ella Fitzgerald loves all the flavors. Thanks Chewy, and thank you B.F.F. 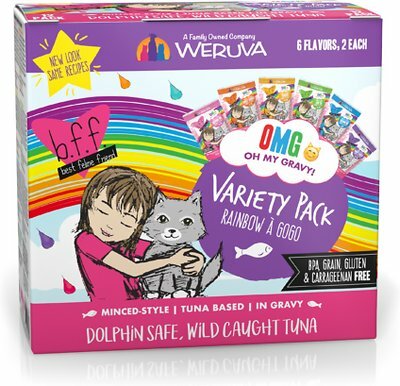 I thought Kitty had tried all the OMG varieties and then I saw these with the different tuna combinations! Kitty loves all OMG (except the one with shrimp - Kitty is allergic to shrimp) and this was no exception! He has tried every tuna combinations and quickly and happily eats the whole pouch! There is a lot gravy in each pouch which is Kitty's favorite!